Encroachments upon the lives and lands of Eskimos, Indians, and Aleuts multiplied with the passage of time. Aboriginal land rights were ignored by American citizens and others as they sought profits from the natural resources of Alaska. By 1900 these new migrants numbered about 34,000 persons, making Natives for the first time a minority in their own land. The gold rush. It was the discovery of gold in Alaska and the neighboring Yukon Territory of Canada which led to the first great migration of whites to Alaska. The small number of miners who sought gold at Juneau in the 1800s became a swarm with discoveries in the Klondike district of the Yukon, and later in interior and western Alaska. As noted in the last chapter, the first to be affected had been the Aukwan Tlingits who gave way to prospectors at the site of what was to become the city of Juneau; and as early as 1880, Chilkat Tlingits had been forced by threat to allow prospectors passage through their country. Following the discoveries in the Klondike district in 1896, thousands of prospectors made their way across the mountain passes. Karta Bay, Alaska, July 17, 1902. Dear Sir: I am a native born of Fort Wrangell and would like to know if there is any chance of getting papers for holding mineral lands in Alaska. I was educated in the East, in Philadelphia, and at Carlisle Indian School. I was almost brought up as a white person, and I have lived up to it ever since I left school. If you want to find out about my reputation you can find it out from my brother-in-law, John Kelly, who has lived in Killisnoo and Sitka for a good many years. Also, you can inquire of any merchant in Wrangell. I like to prospect, but as a native have no right to hold a claim, and I never know what to do with the prospects that I have found, and there are only a few white men that can be trusted, to my knowledge, in a case of this kind. I am 26 years of age, and I think I could do well if I could succeed in getting my citizen papers or rights for holding mineral lands in Alaska. I want you to advise me what to do to get it, or if you can do anything for me let me know it soon and oblige. My address will be Loring, Alaska. Source: "Report of the Governor of Alaska" in Annual Reports of the Department of Interior, Government Printing Office, Washington, D. C., 1902. Eskimos of western Alaska and Athabascans of the interior were next to experience the flood of gold seekers. By 1900 the beaches of Nome had drawn nearly 20,000 people from elsewhere in the world. Thousands of others were scattered along western and northern rivers and creeks in search of gold. With the strikes in 1902 in the vicinity of what was to become the city of Fairbanks, disappointed stampeders poured into interior Alaska from the Seward Peninsula, the Klondike, and from the United States. They also went to Cook Inlet, the Copper River area, and elsewhere. 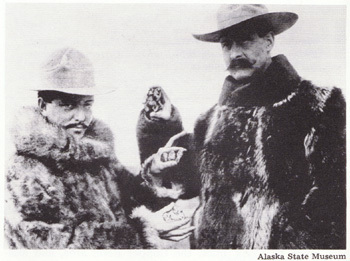 By 1908, over $140 million in gold was taken from Alaska. Some had certainly struck it rich, but Natives were not among those who did. Although Kowee, an Aukwan Tlingit had led Joe Juneau to gold, he did not share in the wealth. Nor did Tom Guarrick, the Eskimo who had located one of the first gold deposits on the Seward Peninsula. Mining claims could lawfully be staked only by citizens. Since Natives were considered to be members of "uncivilized tribes," they were not accorded citizenship by the Treaty of Cession. For Natives, the gold stampede meant a drastic reduction in moose, caribou, and small game as prospectors hunted these animals for their food supply. In many areas, gold mining resulted in siltation of salmon streams, destroying them. But contact with the white men had even graver consequences. In the words of William H. Dall, a scientist associated with Alaska for over 40 years, "civilization and the greed of gold [had brought] drink, disease, and death." The salmon industry. Even before the first gold strikes, the salmonthe most important single food resource of Nativeswas being harvested and marketed by others. Tlingits of southeastern were the first to be affected as canneries were established in 1878 at Klawock and Old Sitka. Eskimos and Aleuts were next as the number of canneries grew and spread to Prince William Sound, Cook Inlet, Kodiak Island, the Alaska Peninsula, and Bristol Bay. Native catches of salmon had been based upon their need for immediate use and for drying or smoking for the winter months. Some additional quantities were taken to be used in trade. Each year thousands of fish were taken. The interest of the commercial salmon packers, however, was to catch as many as could be processed and sold. Using a variety of methodsseines, nets, and traps as appropriatethe packers and their fishermen took millions of fish from the creeks and streams. we met a committee of native men who, through an interpreter, told us of how they were denied the right to fish for themselves, and refused employment by the canners as well. It seems that owing to the fact that seines were stretched across the mouth of the river the salmon could not ascend the stream and consequently there were no fish for the natives to get whenever they did attempt to get any; and being refused employment as regular hands along with the foreigners, they could not make a living. Afognak, Alaska, June 22, 1899. Sir: We, the natives and all the Russian population of Afognak, appeal to your excellency to help us to retain possession of the fish streams where we are dependent upon getting our winter's supply of food for ourselves and families. We can not get any chance of fishing in the streams, as the cannery fishermen of all the companies operating here have taken possession of the mouths of the rivers. They stretch a rope across the water, and as the rope vibrates from the force of the current, they frighten the fish. In the meantime they seine fish directly at the mouth of the stream. We tried to remonstrate with them and they threatened to smash our skulls. We lay these facts before your excellency so that you may give us some assistance. We can not allow our families to starve, and if the canneries are allowed to carry away all our fishthe main foodwe will be obliged to starve. Chiefs for the Afognak Population. Source: . "Report of the Governor of Alaska" in Annual Reports of the Department of the Interior, Government Printing Office, Washington, D.C., 1899. They are essentially fish-eating Indians, depending upon the streams of the country for a large amount of food supply. These streams, under their own administration, for centuries have belonged to certain families or clans settled in the vicinity, and their rights in these streams have never been infringed upon until the advent of the whites. No Indians would fish in a stream not their own except by invitation, and they cannot understand how those of a higher civilization should beas they regard itless honorable than their own savage kind. They claim the white man is crowding them from their homes, robbing them of their ancestral rights, taking away their fish by shiploads; that their streams must soon become exhausted; that the Indian will have no supply to maintain himself and family; and that starvation must follow. The commander, Jefferson Moser, said his sympathies were with the Indians and that he would "gladly recommend, if the way were clear, the establishment of ownership in streams." But, he said, "it is impracticable, and I only ask for him a consideration of his claim, and whatever law is framed, that a liberal balance be thrown in his favor." Sea mammals. Northern and western Eskimos and Aleuts who depended upon sea mammals were not spared as white men sought the resources of Alaska's waters.
. . . was almost to exterminate the animals in the Pacific, causing suffering and death among the Eskimos because of the taking of their food supplies in whale and walrus, thus throwing them onto the caribou and seal, which were insufficient. The caribou were nearly exterminated, and the natives perished from famine and consequent pestilence. In these same years, the numbers of fur seals and sea otters were sharply reduced by hunters employed by American companies. A California corporation had been granted a lease to harvest the fur seals of the Pribilof Islands on a regulated basis, but the slaughter of the seals at sea by others was rapidly depleting the herd. Aleuts employed by the corporation at St. Paul and St. George harvested 140,000 seals the year after the purchase. Twenty-five years later, the total number of seals taken on the islands was 7,390. The taking of the even more valuable sea otter of the Aleutians was not regulated after the departure of the Russians. In the 1880s almost 5,000 pelts were taken annually by American companies but, as Andrews reports, in 1910 only 29 pelts were taken. The sea otter had been virtually exterminated. What, if anything does the General Government owe the natives of Alaska, and in what form shall the payment be made? It is a problem great in its moral as well as in its practical aspects. Having largely destroyed their food supplies, altered their environment, and changed their standards and methods of life, what does a nation that has drawn products valued at $300,000,000 owe to the natives of Alaska? Will this nation pay its debt on this account?